Every day should start with a rollercoaster ride and that's exactly what you'll get when you ski at Panorama Mountain Resort. Ride the Champagne Express Chair first thing in the morning to the top of the fast, and cruisy "Rollercoaster," immaculately groomed each day, and marvel in awe at the scenery spread out around you as you fly down the fresh corduroy, beaming from ear to ear. Panorama Mountain Resort is located 20 minutes outside the Community of Invermere in the Columbia Valley. From Calgary, it is approximately a 3.5 hour drive across the border into British Columbia. We've found that we can easily make it to the resort Friday night for a quick power ski weekend, but that it's definitely more fun to make a long weekend of it. Summit to base with a vertical drop of 1300 metres and over 5km of skiing in one descent! On our recent visit to Panorama, we connected View of a Thousand Peaks off the summit to "Zehnder Way" in the Founder's Ridge area, another steep black run that had been freshly groomed, and we marveled at the lack of lift lines (we rode three chairs to access the summit and never waited in a line - on a weekend!) We also expressed complete shock (and delight) that we didn't see a single other skier the entire time we skied down from the summit until we reached the top of the Discovery Quad at the bottom. We enjoyed 5.5km of steep groomed black skiing on that one descent alone, no line ups, and no other skiers in sight. Anybody loading skis in their car yet? Morning on "View of a Thousand Peaks"
The Sun Bowl is a fun cruisy place to explore, especially in the afternoon when the sun has warmed up the snow. 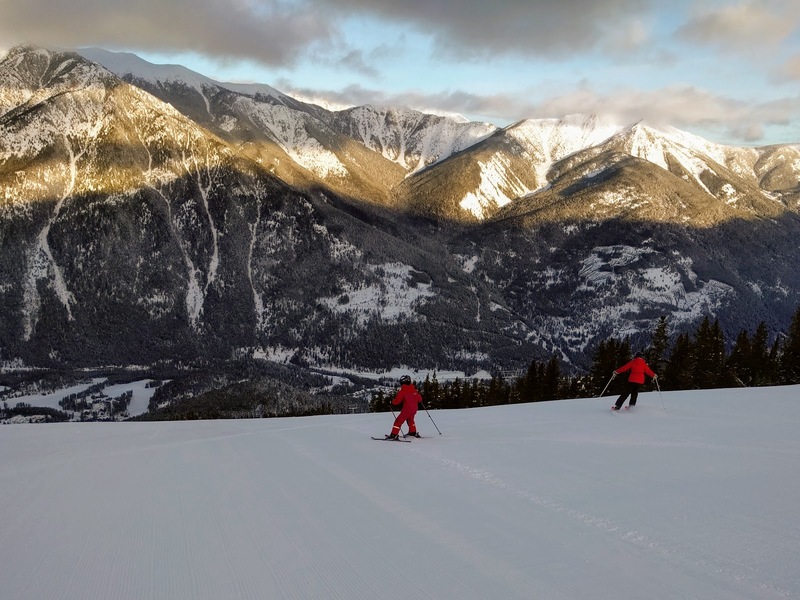 Most of the runs through the Sun Bowl are intermediate and there are always a few groomed options. We were lucky on our second day at Panorama and discovered that they'd groomed the very steep "Roy's Run" off the summit, a black run that's usually filled with car sized moguls, and so we were able to link this to Schober's Dream. This has got to be the coolest thing about Panorama, and I always feel like I'm skiing in the Alps. Three chair lifts take you to the summit, climbing 1300 metres, where you'll be greeted by the Summit Hut, a great place to warm up and grab a freshly brewed Kicking Horse Coffee (the best coffee on the planet) before descending either Get me Down (blue) or one of the black runs to the top of the Champagne Express Chair. From the top of the Champagne Express, fly down Rollercoaster until you come to the Elkhorn Cabin. Here you'll find great views from a historic cabin perched on the side of the mountain. European Raclette is served if you time your visit for lunch, and otherwise, I highly recommend the fresh apple cider! Make your way down from the Mile 1 Hut (my son loves to drop down through the giant terrain park off "Horseshoe") and you'll find yourself at the bottom where, you guessed it, there are even more options available for dining and snacking! My personal favourites are the Picnic Cafe for a sandwich or a fresh cup of coffee, or the T-Bar & Grill - which has amazing nachos! Note that each of these huts is more "restaurant" than just a "warming hut" and that while you can definitely go inside to get warm on a cold day, you should plan on buying a cup of coffee or hot chocolate at the very least if you're going to take up chair space. If you want an area in which to enjoy your own bag lunch, you'll find plenty of table space in the "Great Hall" in the main Village. Here you'll also find a cafeteria and space to store bags or backpacks. 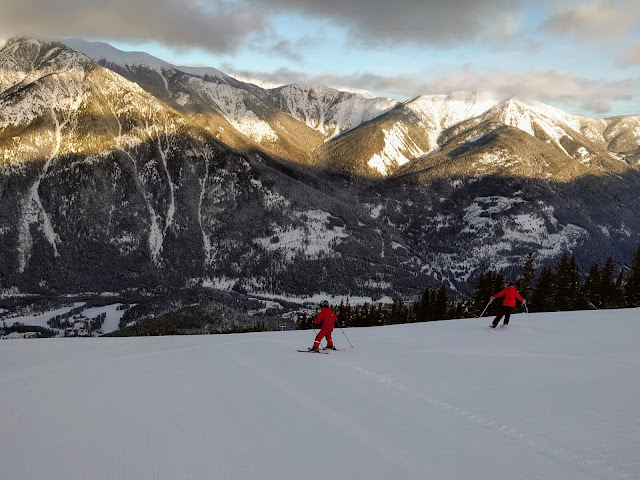 I am slowly working my way through the Taynton Bowl Tour but I'm not quite ready for double black skiing off the summit so I usually cheat by dropping down View of 1000 Peaks and Stumbock's, both often groomed, to connect to the Taynton Trail down below. Strong skiers will definitely want to give "Heli High" a try though before making their way further along Outback Ridge. From the Goldie Plateau, expert skiers enjoy double black chutes and bowls as they make their way back down to the Village. All runs end up in the main village so you could technically do laps all day. Panorama is the ultimate hill for progression with discounted pricing available for the beginner lifts. A Discovery Zone lift ticket gives you access to the Discovery Quad, Silver Platter, Red Carpet, and Little Ripper Carpet. Graduate from the Discovery Quad, and skiers will then find easy groomed green runs off the Mile 1 Express, the Toby Chair (which also has an amazing terrain park,) and the Sunbird Chair. I consider myself to be a strong intermediate skier because I prefer to ski groomed terrain (be it blue or black.) Panorama is the ideal ski hill for those who love flowy cruisers, who want a good assortment of groomed runs, and who enjoy steep black runs that have also been groomed. On our recent trip, I was able to ski 9 different advanced black runs, all groomed with beautiful corduroy. This was a record for me, and usually I'm lucky if a ski hill grooms one or two black runs for me. The terrain at Panorama can be broken down into 20% beginner, 55% intermediate/advanced, and 25% expert, so you can see that it's an intermediate skier's paradise. And lest you start to think that Panorama is only a hill for those who love groomers, despair not. There are plenty of natural runs filled with bumps, glades, and soft powder. 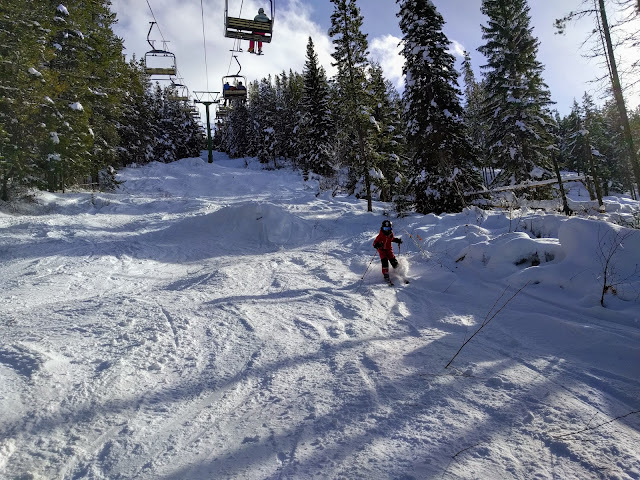 My husband and son often split off onto other runs off the top of each chair to chase after terrain that was more challenging than what I was looking for. 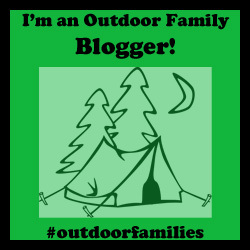 My husband would fall into this category and he loves the terrain at Panorama. This is the kind of resort you can ski regularly for years - and still find new places to explore each time you visit. Add the new monster cat skiing, and nobody's getting bored here. Panorama for Skiers who like to "Play"
There's also a more advanced park off the Mile 1 Express Chair where my son was given very clear instructions to "roll everything!!" This story has a LOT more photos because it was actually warm enough to take a camera out of a pocket. 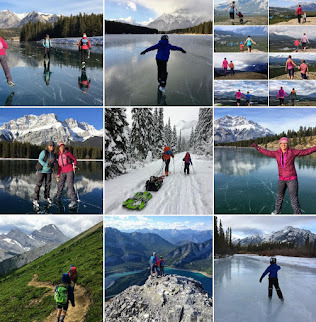 Our recent trip had weather as cold as -35C with wind chill at the summit so photos were limited. This is one of my favourite things about Panorama and it would not be the same to visit for a day without staying on the hill. Stay at the resort and you won't need a car the entire duration of your visit. A small gondola connects the Lower and Upper Village (with free service through the day and evening) and there is no shortage of restaurants spread around the resort. You'll even find a grocery store (with alcohol for purchase) and a take-out pizza restaurant in the Lower Village. 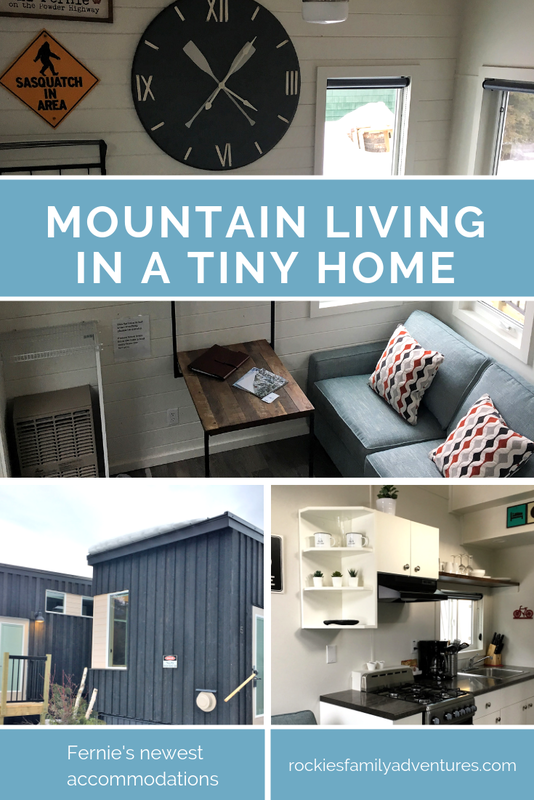 Keep reading to learn more about why you want to spend your ski vacation in the heart of the Panorama Mountain Resort. Bring the Non-Skiers! 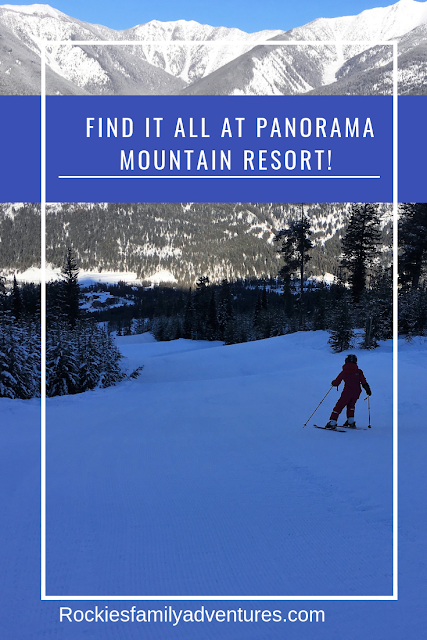 Panorama is more than a Ski Hill! We spend many weekends in the Columbia Valley and have visited Panorama for the day several times - without ever purchasing a downhill lift ticket! The beauty of this resort is that you don't actually have to like downhill skiing to enjoy spending time at Panorama. There are dozens of other activities you can try without ever stepping into a pair of ski boots or riding a chairlift. 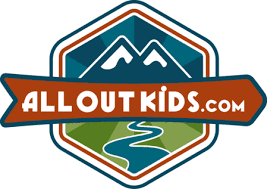 Bring the grandparents, the baby, the toddler, the whole extended family, or even a spouse who may not enjoy downhill skiing (but still wants to spend the weekend with the family.) There is something for everybody at Panorama! And these are GOOD trails, "real" trails, and trails I'd visit even for a day trip. This isn't a case of "ok, you nordic skiers, we groomed you a cute little 3km loop around the ski resort." You can purchase day passes for the nordic trails at Guest Services and they can direct you to the rental shop if you don't have your own skis. All of the nordic trails at Panorama are designated for "multi-use" sports, but you'll enjoy the inner loops more with a pair of snowshoes. The Valley Trail through the golf course is especially scenic. You can purchase day passes for the nordic trails at Guest Services and they can direct you to the rental shop if you don't have your own snowshoes. My mother enjoyed taking short walks along the river when we were recently at Panorama for a weekend and appreciated that she didn't need snowshoes on the well packed trail. She was able to walk out the door of our condo and could connect the Lower Village to the Upper Village afterwards via the Village Gondola to warm up at the Picnic Cafe. We've also enjoyed fat biking on the Valley Trail and were able to rent bikes for our whole family. Bike rentals can be found in the Upper Village near Guest Services and you can loop the Valley Trail 3 with the Prospector's / Valley Trail for a moderate 3km ride on a packed/groomed trail. Resort roads connect you back to the top when you're finished. 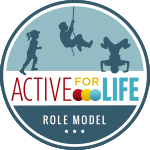 Find the daily activities offered here. Enjoy decadent walk in/walk out dining at a variety of restaurants in the Upper Village including my favourite, the Cabin Smokehouse. Another good choice is ElevenFIFTY at the base of the hill where you'll find regional cuisine including pizzas and homemade pastas. Book a Heli-Fondue tour at the Summit Hut. Enjoy a flight with RK HELISKI up to the Summit Hut after the lifts close for an early evening après dinner of cheese and chocolate fondue. This is the best (and only) way for a non skier to reach the summit of the ski hill. Book a fondue dining experience at the Mile 1 Hut for a cheese and chocolate fondue dinner Saturday nights. Ride the Mile 1 chair up to the hut (with skis or in winter boots for the non skier) and then enjoy an easy ski down (the run is lit up for night skiing) or ride back down the chairlift if you are a non skier. Try the brand new snowcat limousine dining experience at either the Elkhorn Cabin for raclette or the Mile 1 Hut for fondue. The tour runs Thursdays and Fridays and you must be able to ski down to the Elkhorn Cabin. You finish dinner with a ride in a snowcat back to the base. 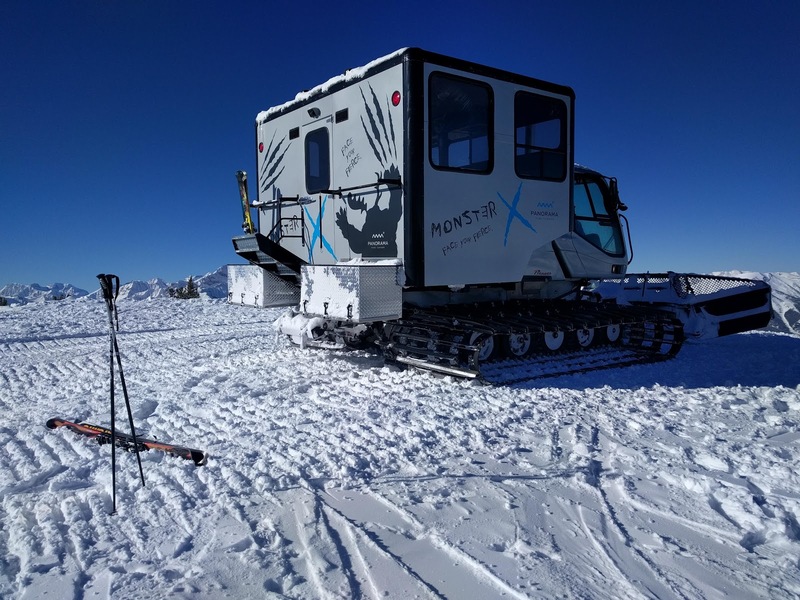 The Mile 1 Hut experience includes a snow cat ride both up and down, making it perfect for the non skier. Information on all dining options can be found here and reservations are required in advance. 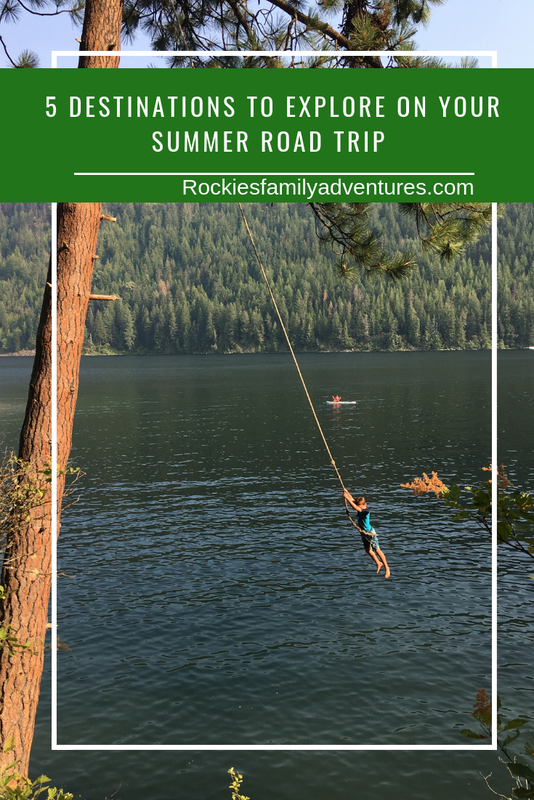 Disclaimer: Our accommodations and lift tickets were provided on this hosted trip. As always, all opinions and words are my own and I was not compensated beyond trip expenses.